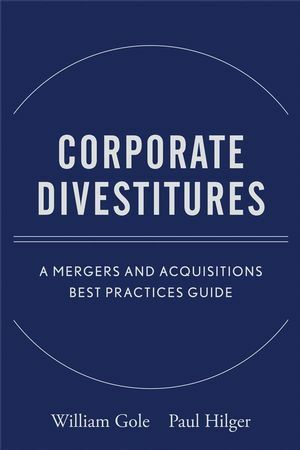 Providing practical application of best practices employed in the divestiture process, Corporate Divestitures provides you with detailed guidance on how your corporation should handle a divestiture. It provides a structured approach that emphasizes disciplined execution and illustrative documents and application aids that can be adapted for use in real-world situations. 1.2 Characteristics of Corporate Divestitures. 1.6 How This Guide Can Help. Appendix 1A. Divestiture Activity by SIC: 2002-2006. Appendix 1B. Aggressive Divesters: 2005 and 2006. 2.2 Strategic Assessment Process Steps. 2.3 Analyze Portfolio and Consider Alternatives. 2.5 Position the Organization for the Divestiture. 3.2 Planning Phase Process Steps. 3.6 Assembling the Divestiture Team. 3.7 Development of the Divestiture Plan. 3.8 Development of a Communication Plan. Appendix 3A. Illustrative Divestiture Timeline. Appendix 3B. Retention Planning Document. Appendix 3C. Weekly Action Item Control (First 8 Weeks). Appendix 3D. Communication Plan Outline. Appendix 3E. Issues & Resolution Control. Chapter 4. Preparing For The Transaction. 4.2 Preparation Phase Process Steps. 4.3 Engagement of External Resources. 4.4 Validation of the Transaction Structure. 4.5 Development of Selling Materials. 4.6 Identification of Potential Buyers. 4.7 Preparation of a Data Room. Appendix 4A. Illustrative Data Room Information Listing. 5.1 Disentanglement: Preparing the Business to be Separated. 5.4 Determining the Required End-State. 5.5 Developing the Disentanglement Plan. 5.6 Quantifying the Disentanglement Costs. 5.7 Executing the Disentanglement Plan. Chapter 6. Managing The Selling Process. 6.1 The Selling Process: Show Time. 6.3 Announcing the Intention to Sell. Chapter 7. Structuring The Transaction. 7.1 Structuring the Divestiture Transaction. 7.3 Bringing in the Required Expertise. 7.4 Analyzing Alternative Transaction Structures. 8.1 Closing, Transitioning, and Learning. 8.4 Managing the Post-Closing Transition. 8.5 Conducting a Post-Deal Process Assessment.